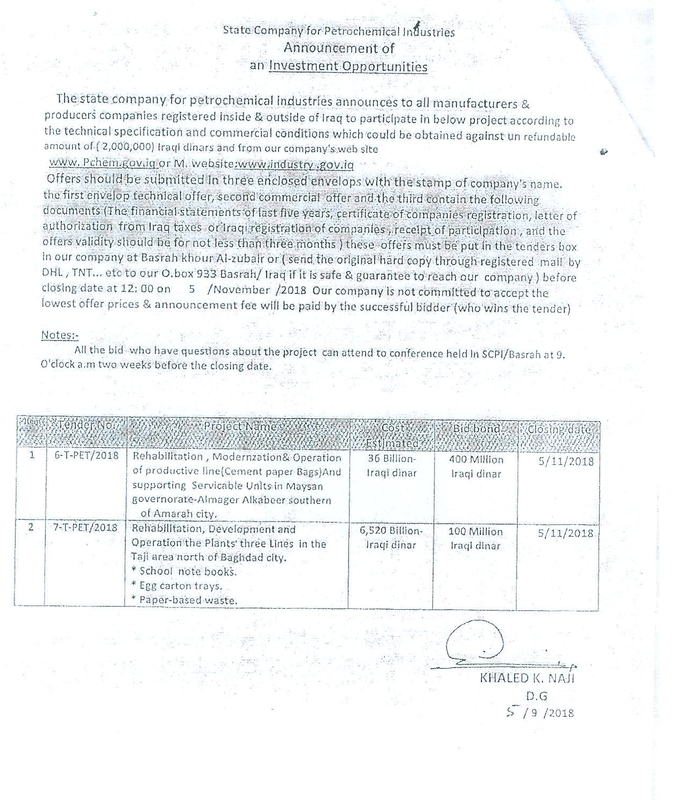 Posted in Business, Commission, featured, Investment, State Company for Food Products, State Company for Glass and Refractories Industry (SCGR), State Company for Petrochemical Industries. Posted in Business, Commission, dextrin production, featured, General Company for Textile and Leather Industries, Investment, Investment Opportunities, Iraq Industry & Trade News, National Investment Commission (NIC), starch production, State Company for Food Products, State Company for Glass and Refractories Industry (SCGR), textiles. 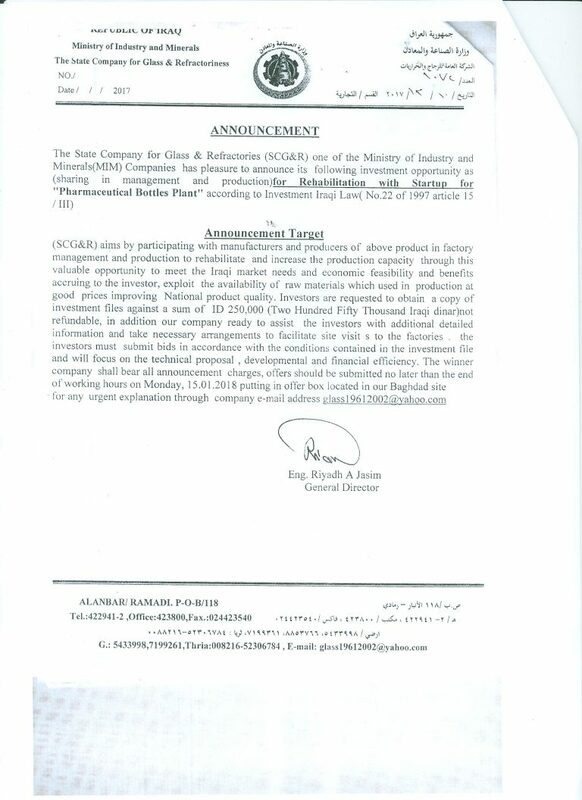 Posted in Business, Commission, featured, General Company for Communications Equipment and Power, Investment, Investment Opportunities, Iraq Industry & Trade News, National Investment Commission (NIC), State Company for Glass and Refractories Industry (SCGR), State Company for Rubber Industries and Tyres. 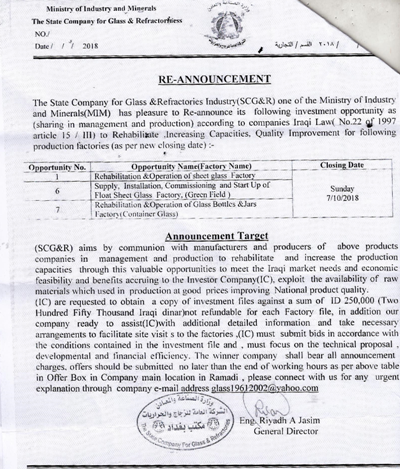 “SCG&R aims by participating with manufacturers and producers of above products in factory management and production to rehabilitate & increase production capacities through these valuable opportunities to meet the Iraqi market needs and economic feasibility and benefits accruing to the investor, exploit the availability of raw materials used in production at good prices improving National product quality. 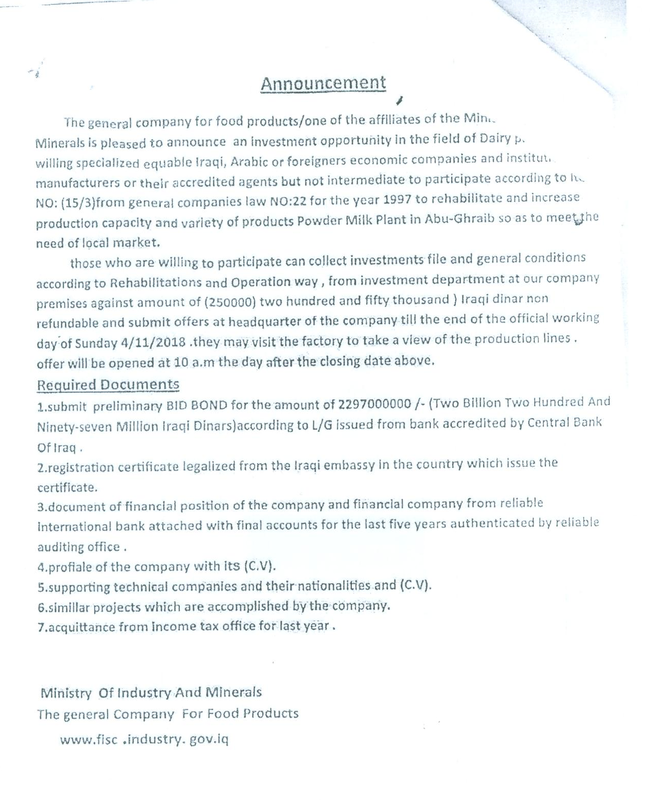 “Investors are requested to obtain a copy of investment files against a nun- refundable sum of ID 250,000 (Two hundred fifty thousand Iraqi dinar), additionally, the company is ready to assist investors with further detailed information and take necessary arrangements to facilitate site visit to the factories . “Investors must submit bids in accordance with the conditions contained in the investment file and will focus on the technical proposal, developmental and financial efficiency. The winner company shall undertake all announcement charges, offers should be submitted no later than the end of the working hours of Thursday, Aug.07.2017. Posted in Citi, Citigroup, Commission, Construction & Engineering In Iraq, Dinar, Dinar Daddy, Dinar Guru, Dinar Recaps, Dinar Vets, featured, Investment Opportunities, National Investment Commission (NIC), State Company for Glass and Refractories Industry (SCGR), Tenders.